Have a special request, or prefer talking to a live representative? Get a guaranteed door-to-door shipping quote over the phone in less than 5 minutes! A 5 star company!! We recently used HaulMatch to ship our cars from Texas to New Jersey, Right from the start they were great to deal with. They explained everything in detail covering all aspects of the shipping beginning to end. They took great care to examine our cars, take pictures and gave an estimated date of arrival. After our cars were loaded, off it went and at the estimated date, there was our car in a perfect condition, just as it was when we gave it to him. This company was referred to us by a friend. We dealt with Pablo, primarily. He was very helpful and knowledgeable. The cost of transport was reasonable and my car was in my office as expected and when expected. I recommend HaulMatch! We purchased a 1968 Firebird on ebay and needed to have it shipped to Montana from South Carolina. I decided to try haulmatch. I would definitely use this service again. We saved $550. The car was picked up on a Thursday and was delivered on Monday. We were happy with HaulMatch. HaulMatch takes the hassle out of your shipping needs. Our online free vehicle shipping calculator will provide you with an INSTANT, GUARANTEED shipping quote so you can rest assured that the quote you receive will be the price you pay. 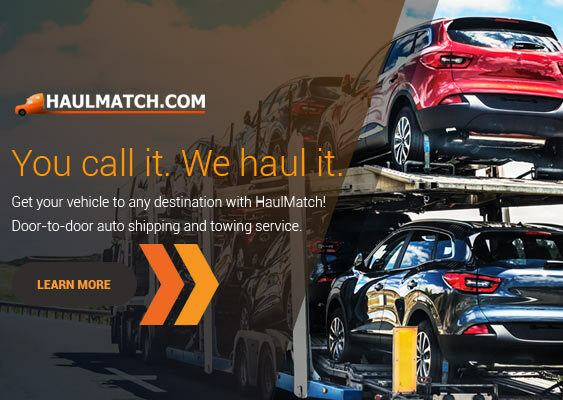 HaulMatch’s online towing network handles nationwide towing and international shipping. Whether you need a towing service for a short distance or a long haul, the towing companies we work with have you covered. We connect you with premier towing companies who have the right equipment (tow trucks, 3-car haulers, 9-car hauler, enclosed trailers and open trailers) to get the job done right. There’s no need to call multiple towing companies to comparison shop. Our quick ordering process allows you to get great towing service at competitive prices. Because we value safe, high-quality service, all of the towing companies in our network are registered with the Federal Motor Carrier Safety Administration, carry valid insurance policies to cover substantial loss, and are among the highest rated towing companies in the industry.